« Hillside Allotments, Ballinagran, Co. Wicklow. Here’s a handy list that I compiled in response to that eternal vegetable growing query that crops up as soon as spring arrives, “Am I too late to sow… (Insert vegetable of choice here)? I decided to put it together as a comprehensive month-by-month list of what you can sow from seed during each of the main seed germination months. Celeriac root, not pretty, but tasty, photo / pic / image. All grown outdoors. With the exception of Celeriac, Celery, Sweet corn and Tomato, all the vegetables listed below can be sown directly outdoors to sprout and grow in your own garden soil. Celeriac, Celery, Sweet corn and Tomato will of course grow on in your soil; it’s just that initially they must be germinated under glass/plastic or on a windowsill. Just a quick look at the list will inform you of the flood of vegetables which can be sown during the upcoming weeks and months. Even as late as August you can see that there are at least eight types of veg you can sow. We can now consign to the scrap heap that old cop out of “Ah sure, its too late for this year, we’ll sow a few veg next year perhaps” For the vegetables to be sown in the upcoming months you still have plenty of time to prep the ground by digging it over to a garden forks depth, removing stones and weed growth as you go. When the individual plots are clear they can be covered with black plastic film (silage cover) to warm up the soil whilst keeping it weed free as it awaits seed sowing. So, on with the list, remembering that the seeds for all these vegetables can be found in any well stocked garden centres. 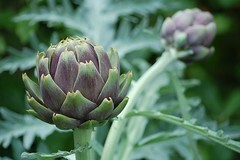 The thistle-like Globe artichoke, photo / pic / image. Perpetual spinach/leaf beet, Spinach, Tomato, Turnip. Now you can print this list out, make a copy or two, laminate it, and then stick it to the door of your fridge or garden shed as a reminder and reference for the vegetable grower in your house. Please note that to allow late sowing of certain vegetables it will be necessary to seek out seeds suited to late growing. Your friendly garden centre will be able to advise you on this, or you can have a look at our growing guides for mention of the specific varieties……. Growing guides. This entry was posted on Monday, April 20th, 2009 at 6:03 pm	and is filed under Vegetable garden tips and advice.. You can follow any responses to this entry through the RSS 2.0 feed. You can leave a response, or trackback from your own site.